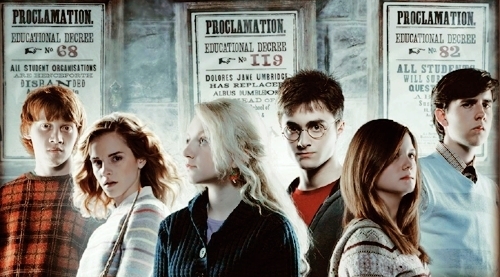 Hermione, Ron, Luna, Ginny, Harry, & Neville. . Wallpaper and background images in the হ্যারি পটার club tagged: hermione ron luna ginny harry neville order of the phoenix harry potter banner. This হ্যারি পটার photo might contain রাস্তায়, শহর দৃশ্য, শহুরে, প্রতিকৃতি, ধনু, and চতুর.